…I don’t have TIME to start watching another TV series! But, BBCA is replaying a bunch of Classic Doctor Who, and I’m curious to take in some of the series that used to scare me when I was little, ha! So far I’ve caught episodes showing the creation of the Daleks and another with #4 regenerating. Every year we almost go downtown to one of our favorite restaurants- The Fish Market or Dublin Square, for example, during the second or third weekend of July. Almost. 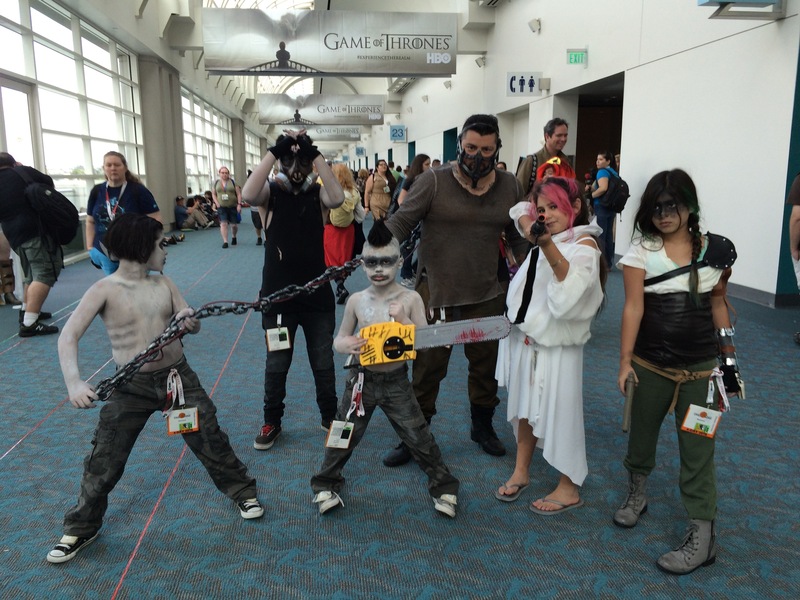 We always smack our foreheads and realize that we have narrowly avoided the utter chaos of Comic Con. 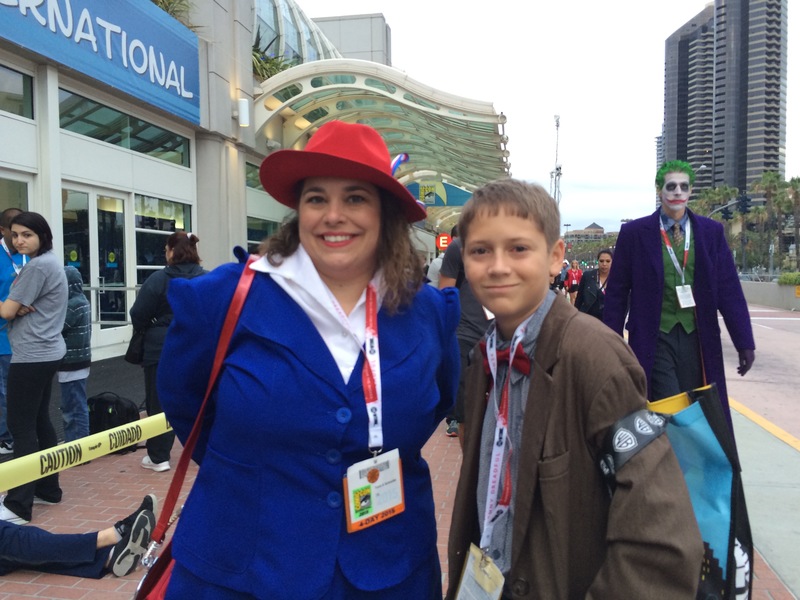 This year, however, we finally braved… The Con. 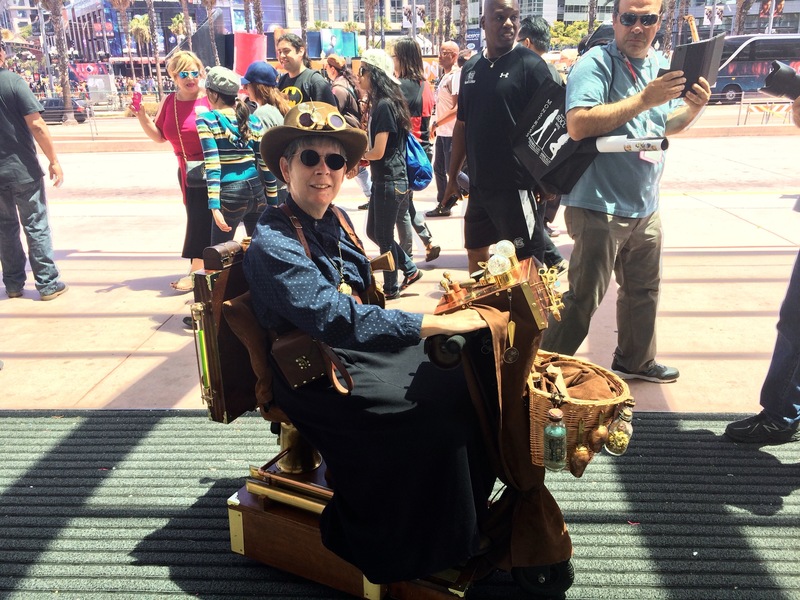 Saturday we trollyed on down to the Seaport Village stop and for the first time, walked around to see the outstanding activities going on for the official pass-less masses. 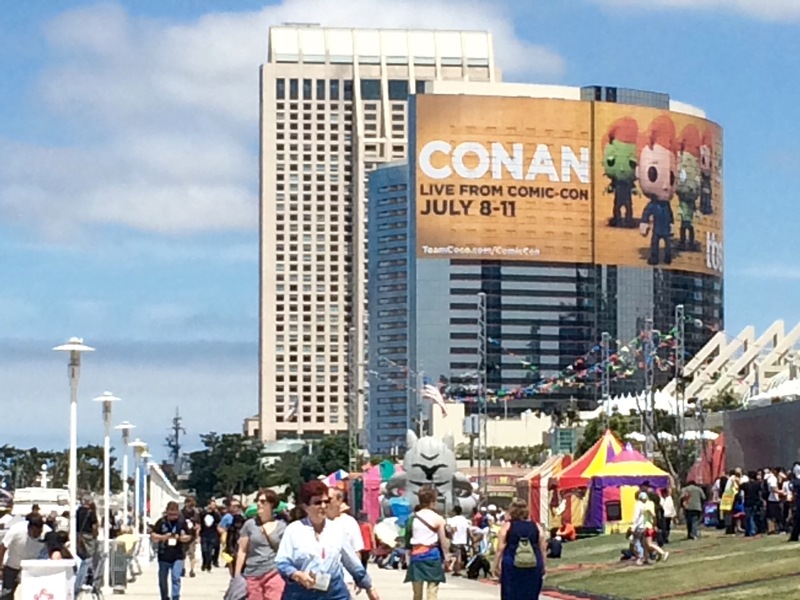 Here’s a couple of views of the waterfront and hotels near the San Diego Convention Center. 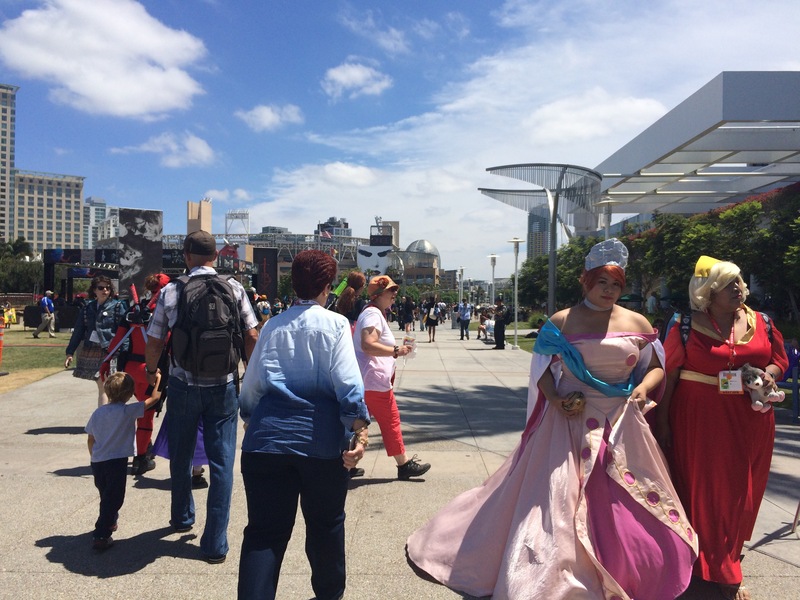 People are lined up to get into the Hall H panels for Sunday already, there is some big dance party going on aboard a yacht, more cosplayers than you can shake a light saber at, and a plethora of goofiness to see all the way to Seaport Village. 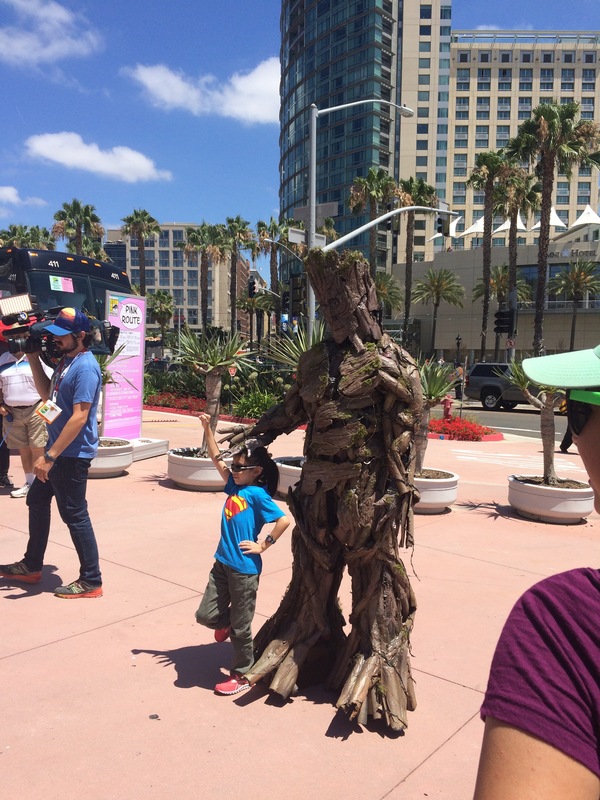 This El Cajon cosplayer won. Hands down, she and her husband made the best costume I saw. 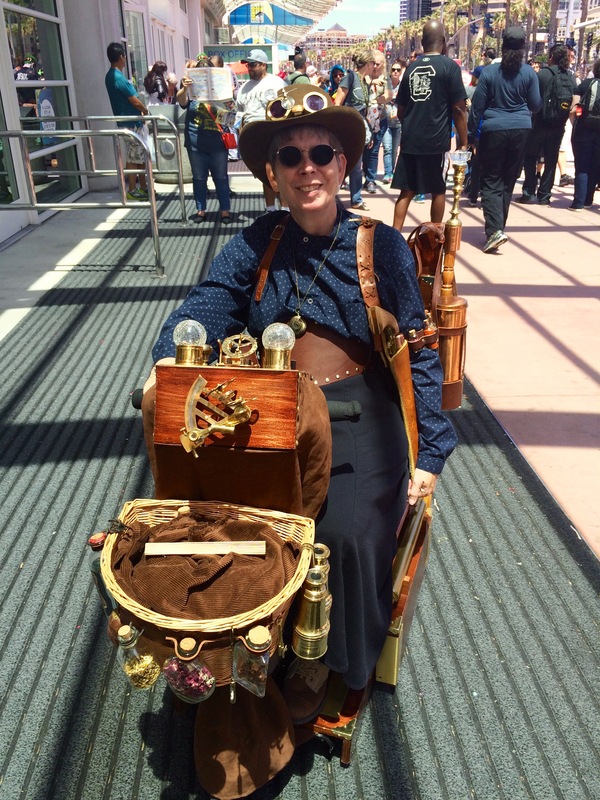 She rocked her Steam Punk tricked-out mobility device, don’t you think? 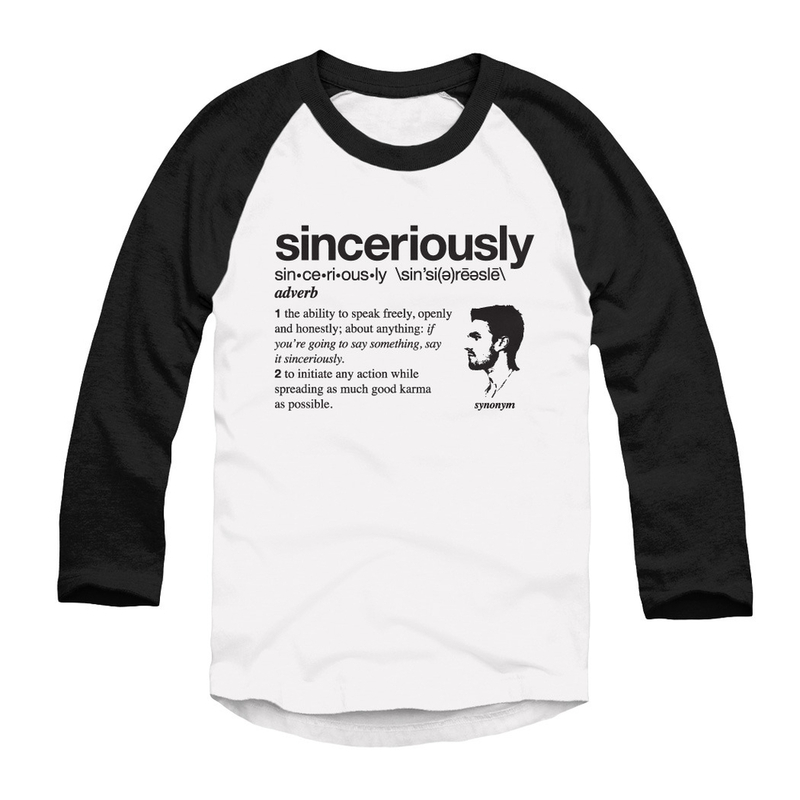 This is a pretty cool shirt associated with Stephen Amell’s (of “Arrow” fame on CW) Sinceriously fundraiser. 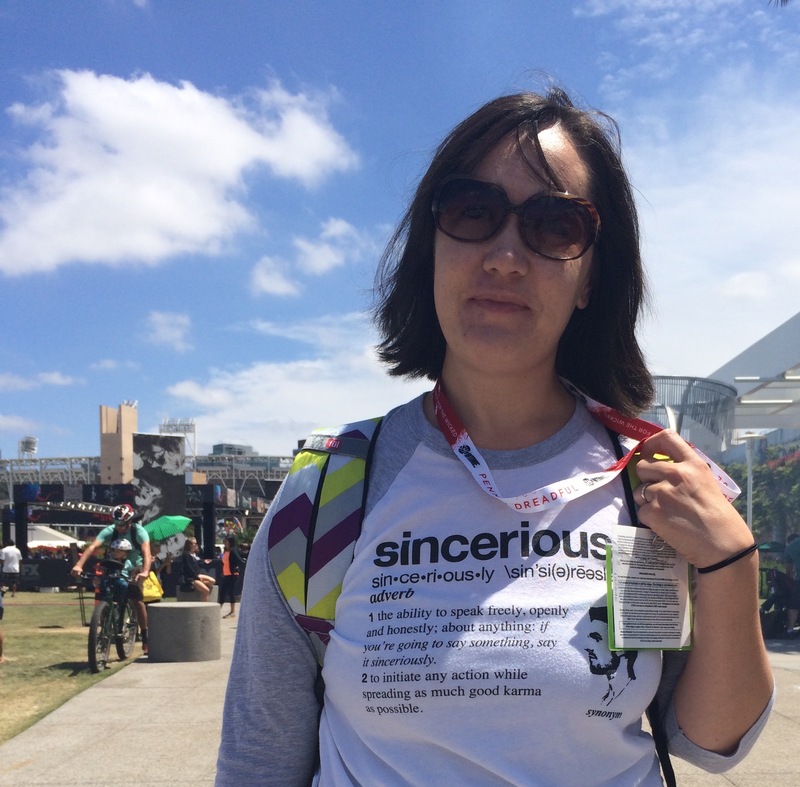 We saw a lot of these shirts. Click on the picture to be linked to information about “Stand for the Silent” and “Paws and Stripes.” Anti-bullying messages and pets for the troops are the main focus there. I’m totally bummed that I didn’t get in to see the Lego Dimensions exhibit. Check out the video- The Doctor in the Delorean and Darth Vader- how fun! 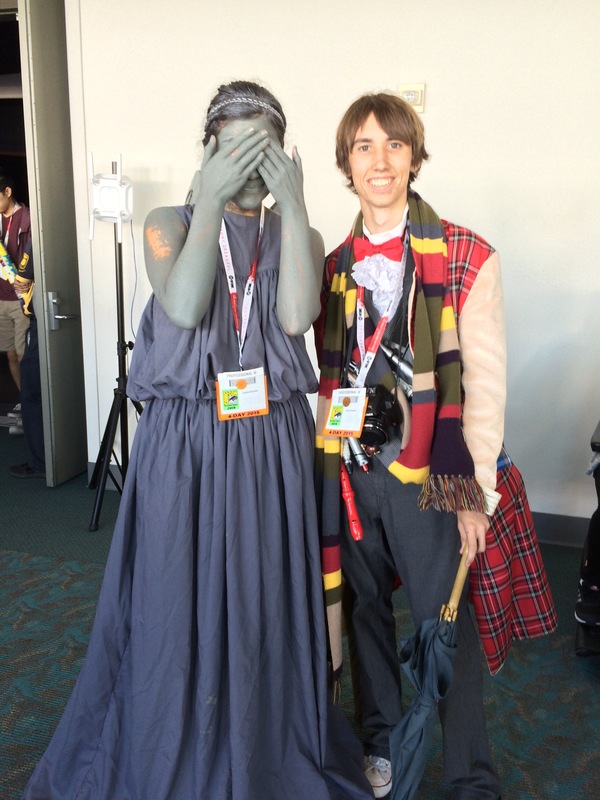 But we did get to see the premier of the Doctor Who Lego Dimensions trailer on Thursday in Hall H.
Sunday is Family Day down by the Convention Center. 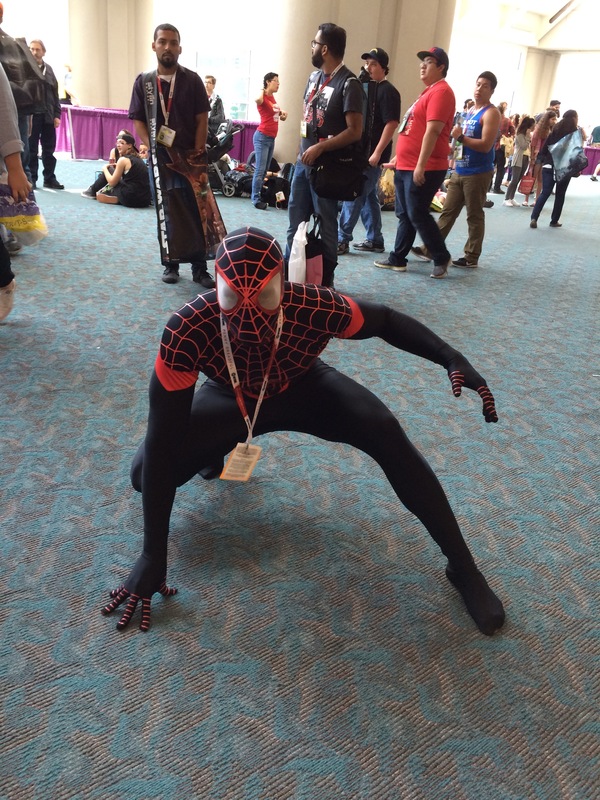 Get down there for what I’m told is the best of the best costumes worn by the tens of thousands of fanboys and fangirls. Take the trolly for the easiest commute! 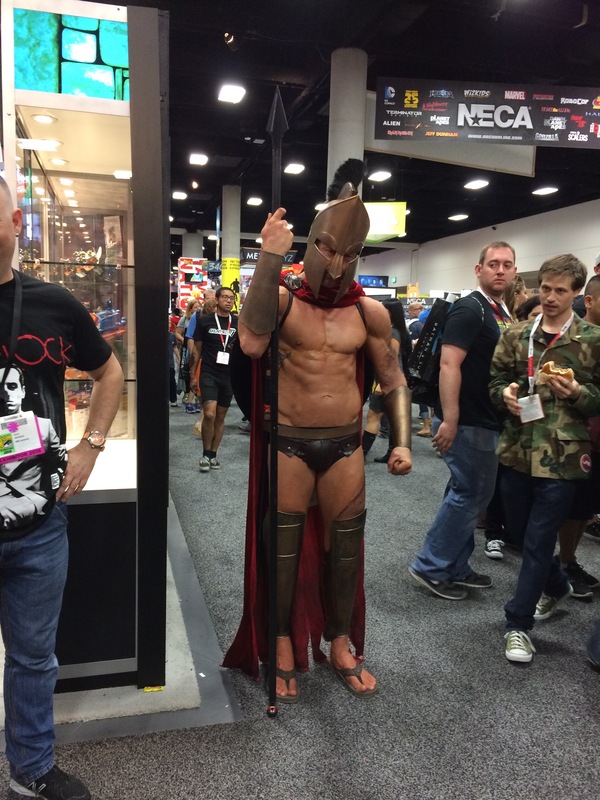 Comic Con International 2015- Hall H Fantastic-ness and Cosplay Craziness! I’m glad that the teens I knew and the Comic Con line sitters that I met on Wednesday talked me into staying in line to receive my Hall H wristband. 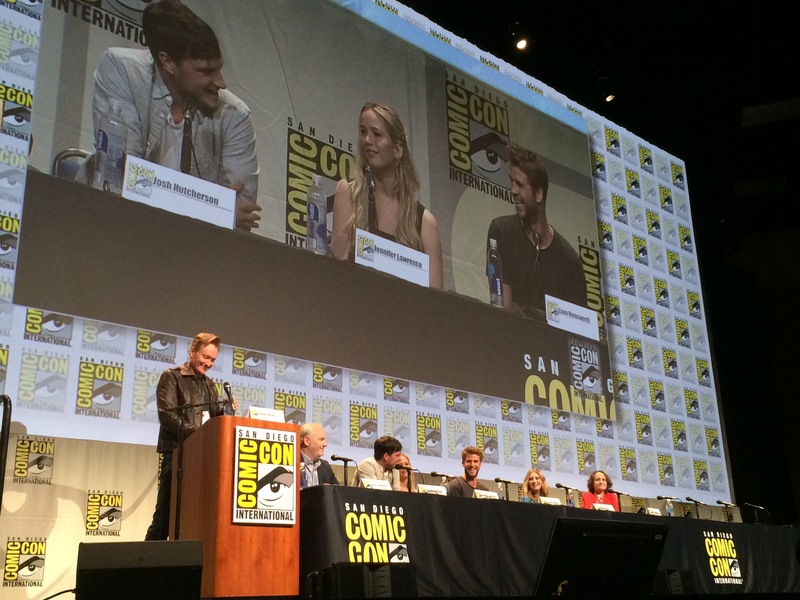 Everyone said that we should experience the fun of the biggest convention lecture hall to see the panels, that it is a great Comic Con experience… They were right! We stayed until after 10:30 Wednesday night to assure that we received our Toucan Wristbands, rode the trolly back to our car, slept for a couple hours at home, then woke up at 4:30 Thursday morning to rejoin our friends in line who slept outside the convention center… line holders are a special breed of people! 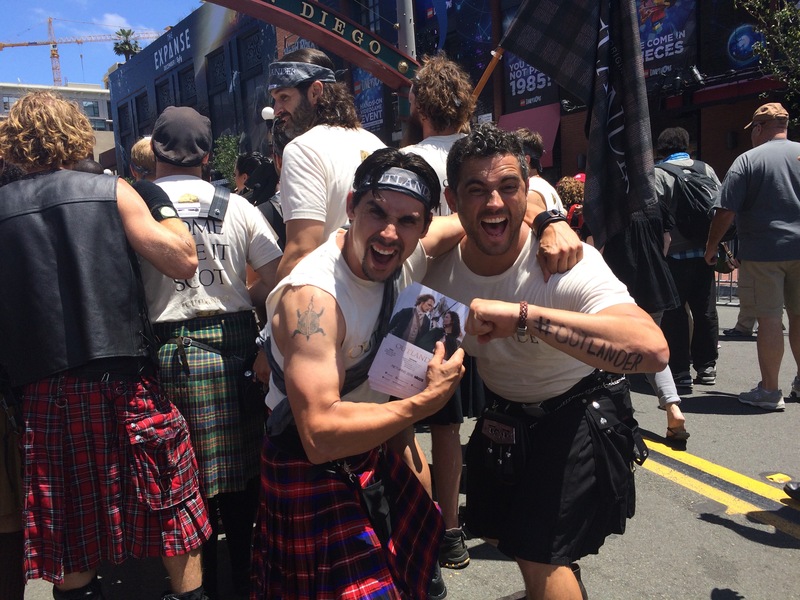 We finally got to enter the Hall H and find seats IN THE FRONT ROW, and a full thirty minutes later hundreds of people were still being ushered in. Over 6,500 seats were filled. One thing that really surprised me was how the convention center and security personnel cheered all of us on as we marched in to find seats. All of the sleepy people who, some having sat out for TWO NIGHTS, were really feeling the love. The first panel was a surprise visit from Mitch Glazer and Bill Murray, promoting their new movie “Rock the Casbah.” Also starring Bruce Willis, Kate Hudson, and Zooey Deschanel, the preview looked great and we are planning on seeing it. 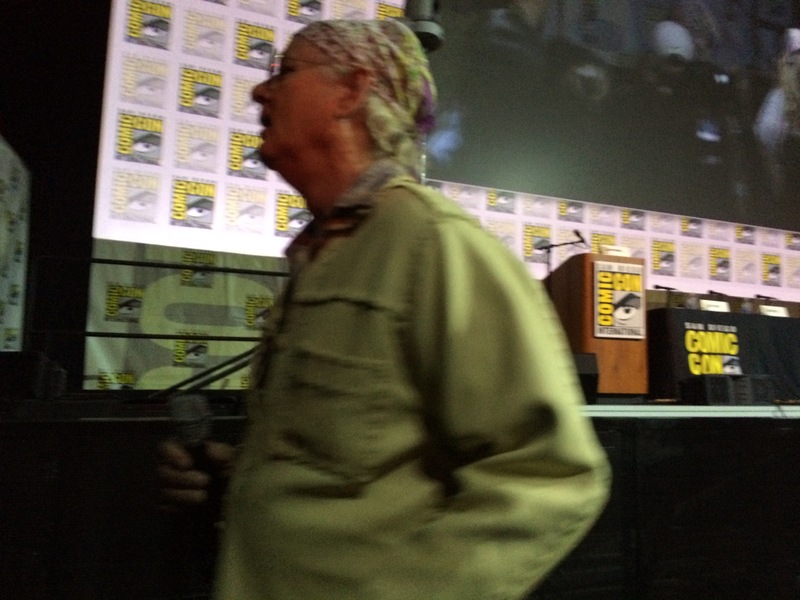 We really did sit in the front row… I could have tripped Bill Murray. 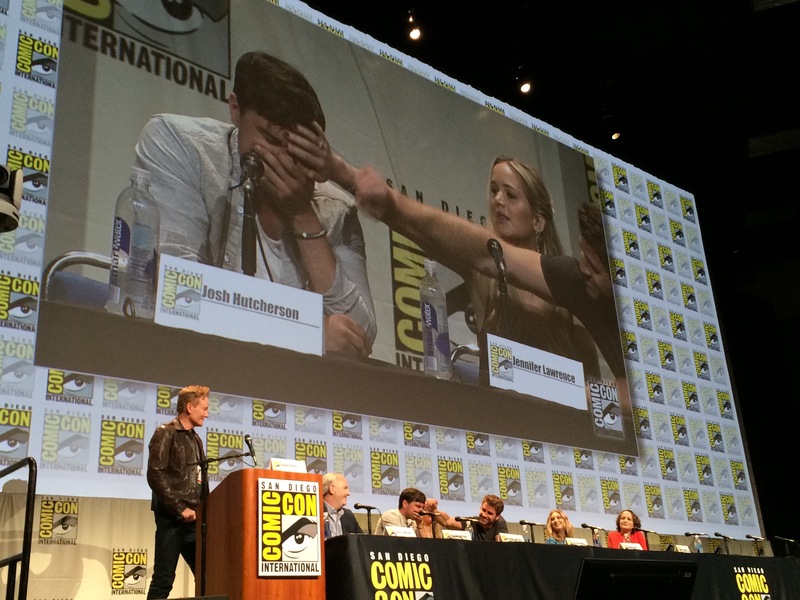 Jennifer Lawrence and Liam Hemsworth giving Josh Hutcherson love. Seriously, click on the You Tube link above to watch this whole panel discussion. Finally, we got to the panel that we had been waiting for, the Doctor Who season nine cast and one of the world’s most loved/hated writers, Steven Moffet! 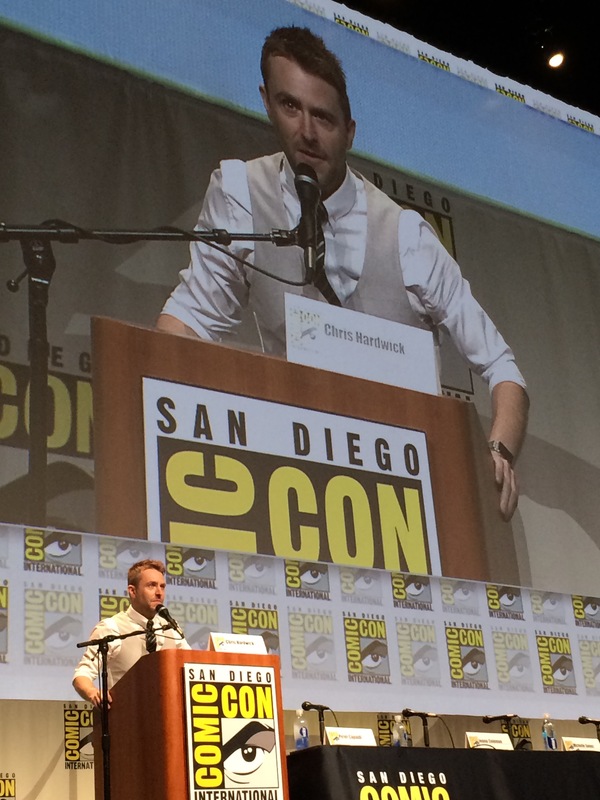 Nerdist.com‘s Chris Hardwick was a great moderator, and we loved hearing from Peter Capaldi, Jenna Coleman, Michelle Gomez and Steven Moffet. Steven Moffet, undoubtedly coming up with an evil plot using Michelle Gomez as Missy, aka The Master. 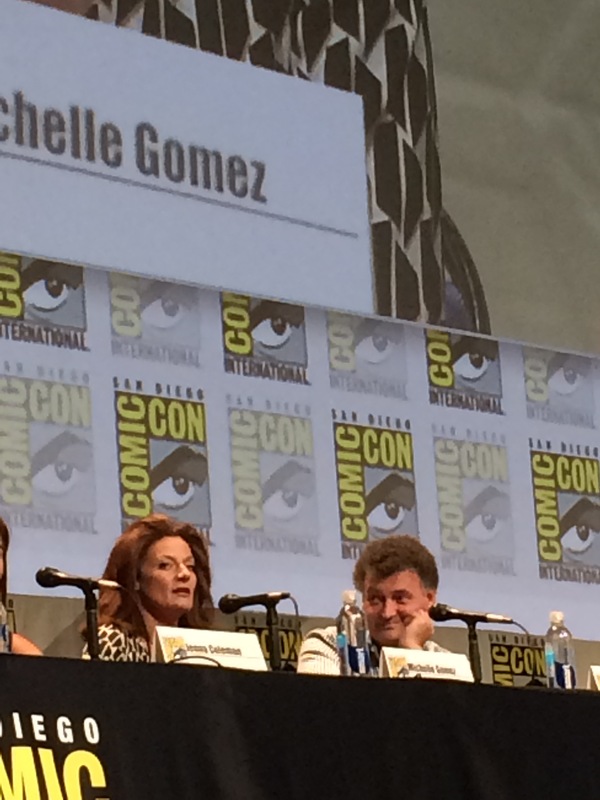 One of the day’s best answers to a question came from Michelle Gomez and Chris Hardwick. In response to what advice they had for an aspiring actor, Gomez urged to never give up, since someone else will be right behind you, eagerly willing to take your place, with Hardwick emphasizing that if you can’t make it via the conventional route, one should self produce one’s own material and get it out on the internet. We have far too much technology and exposure opportunities nowadays to excuse anyone from just doing it. It was fun yet frustrating to hear the cast asked questions; they would look at Moffet before answering… then… not answer since it would lead to spoilers. It was like watching kids check with their papa. One thing we do know, Missy will be back reprising her roll as the regenerated Master. Aiieeee! Can’t wait until September 19th for season 19’s premier!! 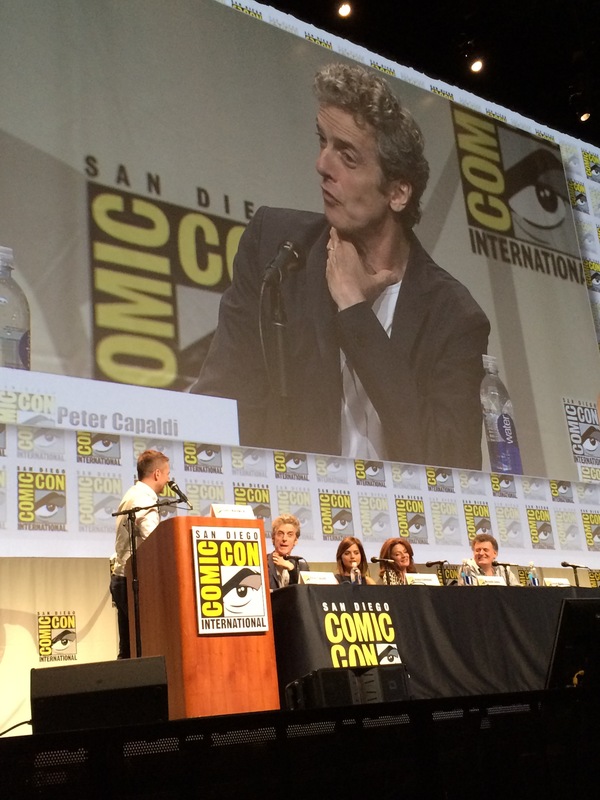 Peter Capaldi, the self professed major Doctor Who geek, answering an audience question. We are very glad to have won tickets for today and have a friend who shared and extra pass. What. A. Blast. To put this into perspective, as much as I geek-out over a show or book, I am very lukewarm on the whole Cult of Celebrity thing. I still had fun! Posted on July 10, 2015 Categories Tourism AdventuresTags Bill Murray, Chris Hardwick, Comic Con International 2015, Conan O'Brien, Cosplay, Doctor Who, Hall H, Hunger Games, Jenna Coleman, Jennifer Lawrence, Josh Hutcherson, Liam Hemsworth, Michelle Gomez, Mockingjay Part 2, Nerdist.com, Peter Capaldi, photography, Rock the Casbah, San Diego, SDCC, Steven Moffet, Suzanne Collins, Willow Shields2 Comments on Comic Con International 2015- Hall H Fantastic-ness and Cosplay Craziness! What do DIY Tutorials and Teen Culture Have in Common? You Tube. Everyone except me… I have to admit, I’ve never used online videos to learn how to do anything. Supposedly there is a video tutorial for everything online. The Girl taught herself how to play guitar just by using You Tube and other online tutorials. The Boy is learning coding. And do we even need to mention how every high school student in the country knows about The Vlog Brothers and their Crash Course videos? John and Hank Greene are better than internet rock stars for this generation of students- they are leaders. Don’t know who they are? READ THIS ARTICLE and get your own crash course in Online Teen Culture- “The Teen Whisperer,” by Margaret Talbot as published by The New Yorker Magazine. You will be glad to know that the Youth of today have better role models than the latest pop star or celebrity. 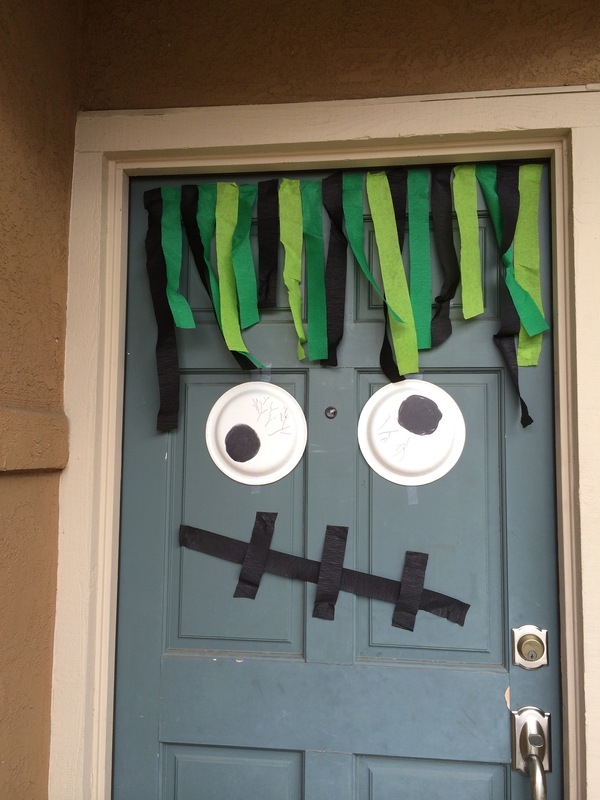 Hide your weather beaten front door behind a Door Monster this Halloween! 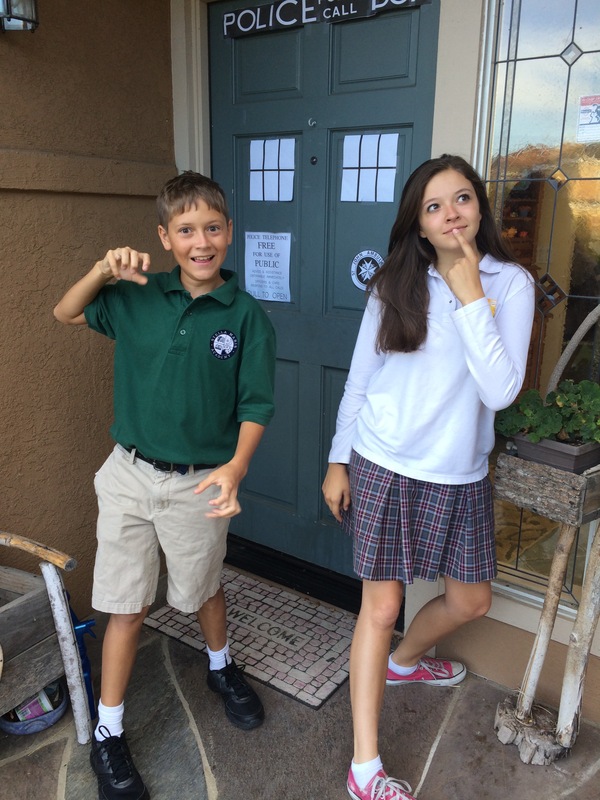 Fall 2014 1st day of school and the leftovers of the Doctor Who party… the fez is out of shot, unfortunately. You Tube to the Rescue! OK. I’m ready to hit the paint counter and get started. Posted on July 5, 2015 Categories New-To-Me Screen Candy, Project of the MonthTags Crash Course, Doctor Who, exterior painting, Home Improvement, home projects, John and Hank Greene, JULY, painting, teenagers, The Tardis, The Vlog Brothers, Ugly Front Door!, You TubeLeave a comment on What do DIY Tutorials and Teen Culture Have in Common? You Tube.